Motherhood, mayhem, and mirth: How to describe the first day of kindergarten. There really are no words to describe how I felt today as we dropped Dylan off for her first day of Kindergarten. Hard, proud, heartbreaking, exciting, sad, oh ya, and I cried. But Dylan? 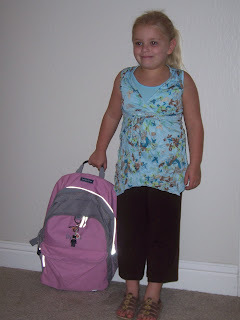 She was so excited she jumped out of bed, grabbed her lunch box and put it in her backpack. She could’t wait to go. She kept asking if we were going to be late. The second the teachers opened the door she told them her name and walked right into the classroom. I called her back to give her a kiss and say goodbye. Then she was gone. Just like that. Proof again that she is well-adjusted and ready for her future to begin. Not me, I’m not well-adjusted at all, I'm not ready to let go just yet. She looks so proud! Does she go half days?? Both of mine start half day preschool at the end of the month. I will be free until 12:30 every day! I don't know what I will do. Oh my.. I vividly remember last year doing the same thing with Brandon. He starts first grade this year and I am NOT looking forward to it! He is.. Momma isn't! !